Marriage was a primary occasion for commissioning portraits through the middle of the nineteenth century. James Reynolds (1754–1834) and Mary Kimberly Thomas (1754–1833) were wed about 1788 and were probably painted then; their first child was born the following year, in 1789. Each is shown in the separate sphere determined by gender: Mr. Reynolds’s masculine presence is emphasized by his standing posture in the conventional hand-on-hip attitude, while Mrs. Reynolds is seated on a fiddleback chair, her receptive pose belied by her direct and determined gaze. Mr. Reynolds’s open jacket reveals a buttoned vest, forming a triangle that points directly to his face. He wears a powdered tie-wig with the hair combed back into a fixed braid; one hand grasps an ivory-handled cane, and a watch key and fob hang at his waist. His tricorne hat is on the wall behind him, and a snuffbox sits on the table. Mrs. Reynolds wears a beautiful, figured open robe over a dark petticoat, a lace shawl crosses over and is tucked into her waistband, and an elaborate lace cap with lappets tops her hair. She holds a rose to her bosom in one upturned hand, and a pot of flowers in bloom sits on a table beside to her, drawing on emblematic traditions associated with love and fruitfulness. Even so, both Mr. and Mrs. Reynolds are painted without sentimentality. Lines creasing their foreheads and the sides of their mouths hint at a sense of humor and make their otherwise severe and masklike faces unusually expressive. These portraits may have been painted by Reuben Moulthrop, an East Haven, Connecticut, artist who achieved renown for his waxworks of full-size figures arranged in tableaux, which were displayed throughout Connecticut, in New York City, and as far away as the West Indies. The portraits of the Reynoldses predate Moulthrop’s earliest documented work, portraits of Sarah and Job Perit, painted in 1790, and show the influence of John Durand, who was active in East Haven, New York, and Virginia. Some of the conventions associated with Durand’s portraits are evident in the portrayal of Mrs. Reynolds: the hand raised to her breast and holding a rose, the other arm crossing at the waist, and the careful disposition of fingers, with their delicate fluttering. The portrait of Mr. Reynolds also refers to Durand’s work in the hand-on-hip pose and the curled little finger, an affectation borrowed directly from Durand’s The Rapalje Children. In both Reynolds portraits, heavy outlining describes hands and clothes and suggests the overlapping of three-dimensional forms. An attempt to create a spatial context is seen in passages such as the black ribbon around Mrs. Reynolds’s neck, which recedes behind the sheer gauze of her shawl. The only major exhibition of Moulthrop’s work—at the Connecticut Historical Society in Hartford in 1956—demonstrated the great disparities in the portraits thought to be by Moulthrop, making firm attributions problematic. Discrepancies between the Reynolds and Perit portraits at first make it seem unlikely that Moulthrop painted both pairs. Similarities of treatment do exist, though, in the artist’s fascination with skin texture; the waxy, sculptural folds of the curtains in the Reynolds portraits recall the ruffles of Job Perit’s shirt; and the star-shaped motif on each of Mr. Perit’s buttons is similar to flowers shown from the stem side in the portrait of Mrs. Reynolds. Heavy outlining is also used in the portraits of the Perits, though with greater discretion than in the Reynolds paintings. Another link between the two pairs is provided by Captain Amos Morris, which is clearly painted by the artist of the Reynolds portraits and related to the signed portrait of Job Perit in the unusual scalloped coat hem that appears in both works. 1. In his statistical analysis of early nineteenth-century American folk portraiture, Jack Larkin discovered that portrait pairs of married couples accounted for up to one-half of the paintings he studied; see Larkin, “The Faces of Change: Images of Self and Society in New England, 1790–1850,” in Caroline F. Sloat, ed., Meet Your Neighbors: New England Portraits, Painters, & Society, 1790–1850 (Sturbridge, Mass. : Old Sturbridge, 1992), 17. 2. This was a second marriage for Mary Kimberly, who was married to Seth Thomas until his death, in 1782. They had four children, at least three of whom died before reaching adulthood. Her second marriage produced two children. A portrait in a private collection similar in style, size, and composition to the portraits of the Reynoldses depicts a young girl. Her relation, if any, to the Reynoldses has not been determined, however. See Nina Fletcher Little, Paintings by New England Provincial Artists, 1775–1800 (Boston: Leether Press in association with Museum of Fine Arts, 1976), 38–41, for additional biographical information on the Reynoldses. 3. “Reuben Moulthrop, 1763–1814,” Connecticut Historical Society Bulletin 20, no. 2 (April 1955): 45. In the (New Haven) Connecticut Journal, September 4, 1793, Moulthrop advertised that an “Artist in PAINTING and WAX-WORK” would be in residence at the “Sign of the GODDESS IRIS in State Street,” exhibiting sensational representations in wax such as “the KING OF FRANCE in the Act of losing his Head, under the GUILLOTINE, preserving every Circumstance which can give to the Eye of the Spectator a realizing View of that momentous and interesting Event. Also A SPEAKING FIGURE, which, even in its unfinished State, has afforded the highest Satisfaction to the Curious.” In the same advertisement, Moulthrop offered miniature and portrait painting, as well as likenesses taken in wax. To further the realism of his wax vignettes, Moulthrop hired two dressmakers from England to live in his home and sew costumes for the figures, which were constructed from a wooden framework, stuffed, and dressed. The heads, hands, and feet were cast in beeswax and painted in oil colors, and natural hair and glass eyes were used to complete the semblance of life. 4. The Perit portraits are in the collection of the Metropolitan Museum of Art, New York. Each is inscribed on the back with the sitter’s name and age, the year, and the artist’s signature: “Ruben [sic] Molthrop, Pinxit.” See Stacy C. Hollander, “Reuben Moulthrop: Artist in Painting and Waxworks,” Folk Art 19, no. 3 (fall 1994): 40, 41. 5. The Rapalje Children is in the collection of the New-York Historical Society. The use of the hand-on-hip convention in America, frequently employed by Durand, is derived from European mezzotints. 6. The small number of documented examples, changeable styles, and deterioration of surface over time have contributed to the difficulties in making firm attributions. The exhibition sparked reactions regarding the attributions, and these were discussed in the pages of the Connecticut Historical Society Bulletin 21, no. 4 (October 1956), and 22, no. 2 (April 1957). Later, several of the portraits were discovered to be by other Connecticut artists. 7. The portrait of Morris is in the collection of the New Haven Colony Historical Society; see Hollander, “Reuben Moulthrop,” 39. It was painted about the same time as the Reynolds portraits and before the documented Perit portraits. The handling of the faces is similar. Moulthrop was the likely artist of the Morris portrait as the two men were related through marriage, of Morris’s granddaughters to Moulthrop’s brothers-in-law. 8. The letters were published in the Connecticut Historical Society Bulletin 20, no. 2 (April 1955). 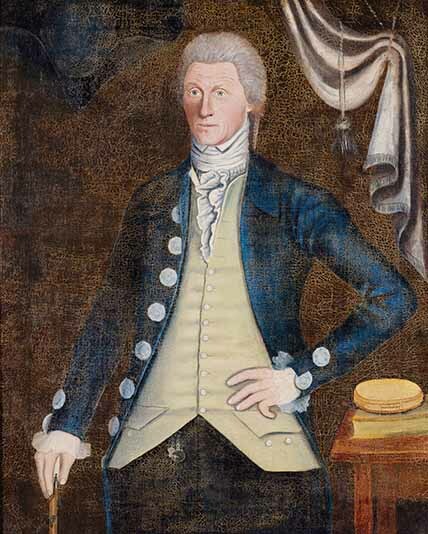 The portrait of Thomas Robbins is in the collectio of the Connecticut Historical Society, Hartford; see ibid., 38. Source: Stacy C. Hollander, American Radiance: The Ralph Esmerian Gift to the American Folk Art Museum (New York: Harry N. Abrams in association with American Folk Art Museum, 2001), 375–76.